Matt Farah's latest video, and why I will never understand fast FWD cars. This is the most entertaining FWD automobile I’ve ever driven. 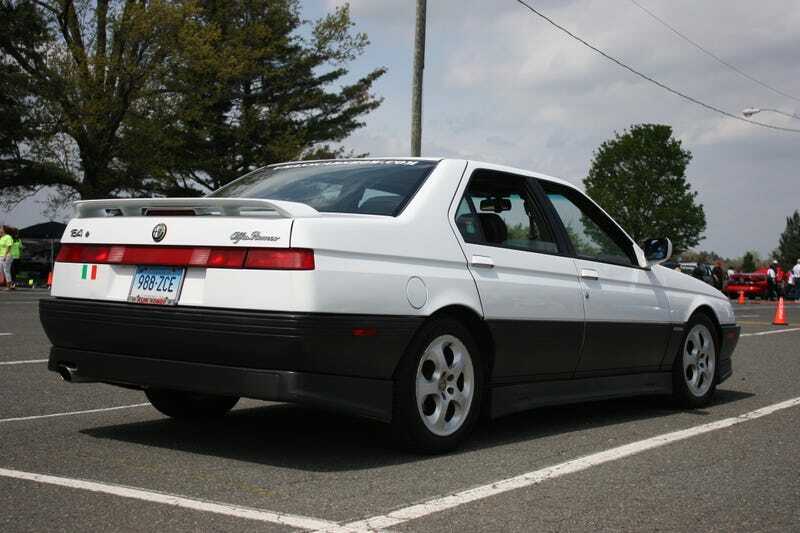 It’s an Alfa-Romeo 164 QV powered by the legendary 3.0 Busso V6. It sounded amazing and looked completely out of place in the pastoral college town I drove it through. Alfas of this vintage are extremely rare in the US, so needless to say, I was thrilled to find myself behind the wheel of this rare beast. I’m not an auto journalist, so 232 horsepower and 200 lb/ft of torque in a 3200 LB car felt pretty quick to me. If you stepped on the gas in second gear, the car spun its tires and lurched to the left when it regained traction. I found this behavior amusing, but also slightly terrifying. Involuntary lane changes are dangerous. As far as I’m concerned, this level of unpredictability is unacceptable in a high performance automobile. I imagine that my experience in my friend’s Alfa isn’t too far removed from piloting an old muscle car on skinny bias ply tires. You aren’t enjoying yourself because it’s an “ultimate driving machine.” It’s fun because the poor driving dynamics keep you on your toes. The same can be said for the tuned 9000 CSE I drove. It was a hoot because it was scary. This car suffered from classic 90s turbo lag AND gnarly torque steer. 250 ft/lbs isn’t much by today’s standards, but when it comes on all at once at the top of the rev range, you’d better hold on for dear life. I’d love to own a 2.3T 9000 at some point in time. Not because it’s a good-looking handling machine. I like it because it’s the quirky antithesis of everything I want out of a high performance car. Now, on to Matt Farah’s latest video. He’s one of my favorite automotive journalists and this is not a critique of his content. I’m criticizing the mentality behind this GTI. Before you ask: Yes, I have driven a modern GTI before. It was an MK7. The torque steer was negligible and the handling was great. That said, it still had a little trouble putting power down in first and second gear. When the load shifted to the rear of the car during intense acceleration, the traction control kicked in and cut power as the the front wheels clawed away at the pavement. It was quick, but you could still feel (and hear) the econobox DNA. You can’t get away from the fact that it’s a Golf with a small turbocharged I4. It’s a compromise based on the same car your grandmother uses to drive her miniature poodle to the groomer. A new GTI starts at 25k. Let’s call that $30,000 with a few options and all of the modifications on display in this video. Thirty grand is a lot of money. 400 horsepower is a lot of grunt. But there’s no LSD, and it’s front wheel drive. I’ll never understand the mentality behind cars like this. If you have that much money to play with, and you want to drive a fun car, what prevents you from buying a sports car? Or a fast sedan? Why would you rather have a glorified economy car? That concept boggles the mind. Yet for some reason, this idea appeals to many people. They buy a new Fiesta ST, or a Civic Si, and then immediately void the warranty via modifying it within an inch of it’s life. They say goodbye to all of the things that made their car an attractive proposition in the first place. It isn’t practical anymore because it drinks gas like a boat. It isn’t discrete anymore because it’s loud. Finally, it drives like an old turbocharged Saab because your peaky 400 horsepower Mazdaspeed 3 is unmanageable unless you’re on the highway. Ultimately, what other people do with their money is none of my business. But that doesn’t change how unimpressed I am by front wheel drive “performance cars.” I know what driving a Civic is like. I don’t care if the badge says “Si” and you’ve slapped a massive turbo on it. I see and hear the same car my elderly parents use to get their groceries. If it had 300-400 horsepower, it would be outrageously scary. Why anyone would go out of their way to create something of that nature is beyond me. I think people who do that just don’t care. They only want to go fast in a straight line. Or maybe they don’t know what “CPO” stands for. And they’re either afraid of used cars, or don’t know enough about them to make a responsible decision. Finally, it’s also possible that they’re afraid of rear wheel drive. This is an LT-1 powered C4 Corvette, which you could buy from 1992 - 1996. The styling is polarizing. Some people, myself included, love the long, low, and undeniably 80s shape. Hate it or love it though, you can’t deny the fact that it’s a fun car. With 300 horsepower and 330 lb/ft of torque on tap, you can be sure that it’s quick. It has a big V8, so it sounds mean. The handling may be sloppy, but you can still steer it with your right foot. This is the car that ruined my friend’s GTI for him. He was a great guy, but he was also a bit of a spoiled brat. His parents bought him the VW as a high school graduation gift. It was his pride and joy. Yet when his coworker showed up one day in a $6000 C4, my friend was flabbergasted. He was jealous of the sound. The speed. The aesthetic punch. The reliability too, and the room in the engine bay for wrenching. He lost all interest in modifying his GTI. No exhaust could match the LT-1's rumble. He couldn’t introduce a understeer-eliminating slip to the rear end without the handbrake. Even if he did tune that 2.0T up to 300 horsepower, it would have major traction issues. And that’s the idea behind my exasperation with expensive, high-horsepower FWD cars. I roll my eyes because modifying a hot hatch to make 300+ horsepower is senseless. It’s like putting makeup on a pig. Just take the plunge into the used market and buy a car that was designed from the ground up to be a sporty car. Try a fast German sedan. Or a Japanese coupe. Anything. And if you absolutely have to go into debt for a hotted-up Focus because you’re a warranty slave, keep it practical. While you’re trying to impress me with “stage three this” and “ECU flash that” I’m picturing a windy road, a low-mileage Z4 3.osi, and the $10,000 I’d save.